Make this beach plastic free, Oh what a sight that would be! Plastic litter on the beach is a scourge to man and beast. It floats on in, off the sea, in a relentless tide of mans debris. Piled high we throw up our hands & cry How can we just let this lie? 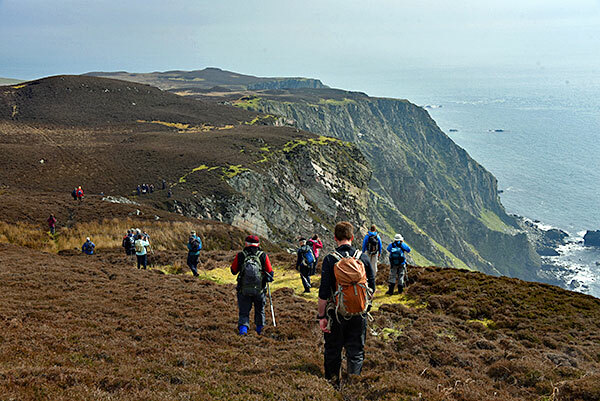 But with visitors and walkers each day we reduce it day by day. 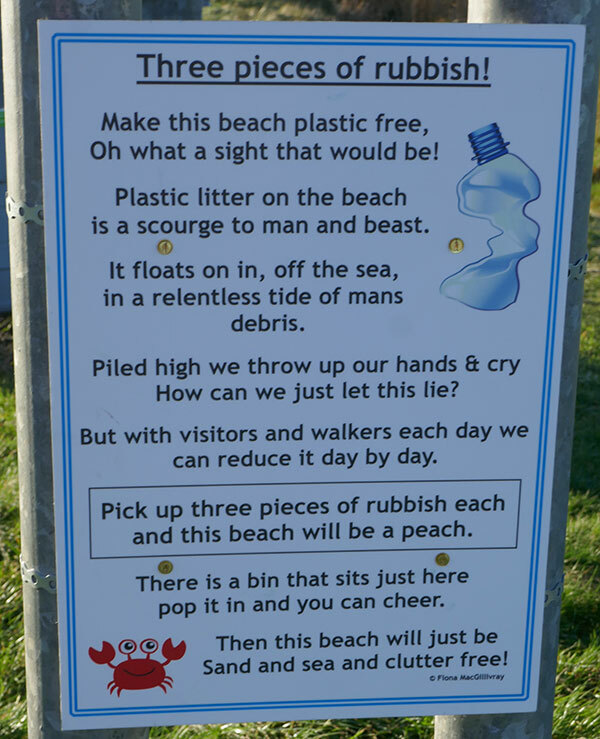 Pick up three pieces of rubbish each and this beach will be a peach. Then this beach will just be Sand and sea and clutter free! 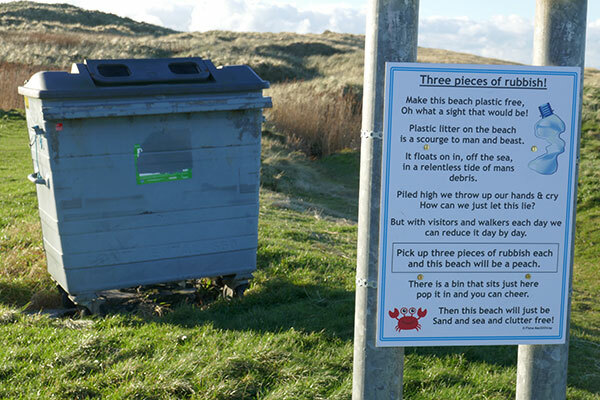 I understand there are plans to put up signs at other beaches on Islay as well. 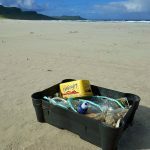 Hopefully they will encourage more people to help with keeping Islay’s beaches clean, so that we can all enjoy pristine beaches (of course it would be even better to avoid the plastic rubbish in the first place, but that’s another topic). 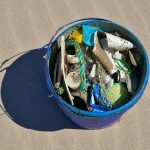 From every beach walk aim to bring back at least three pieces of plastic (or other rubbish, e.g. bottles) and dispose of it responsibly. 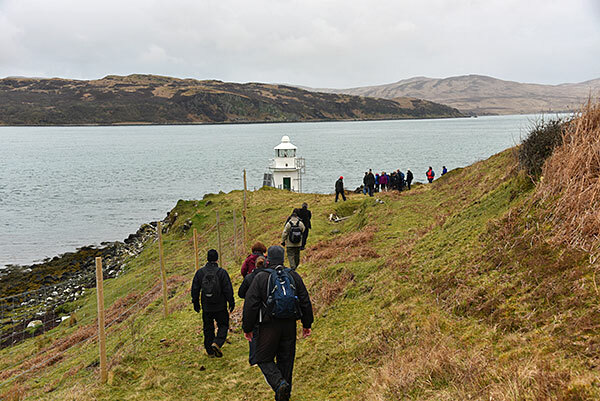 During my last visit to Islay in June I decided to do my bit. When staying at Kilchoman during the second week of my stay I went for a walk on Kilchoman Beach in Machir Bay every morning. During the last return leg (I typically walked up and down the beach twice) I picked up as much as I could carry, often helped by a bucket or something similar I found to allow me to collect and carry it. Quite a few of the findings almost certainly travelled all the way across the North Channel, as they clearly came from Ireland. There was a plastic milk bottle from Donegal Creameries and a Tayto crisp bag. And a few items with Euro pricing. But also various other plastic and other items, like a pen and tennis ball. Not to forget a few bottles (both glass and plastic). I know a number of others are picking up plastic on their beach walks. Also while I was doing it I got chatting with a couple on their beach walk and they joined as well and picked up plastic. 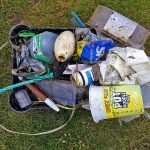 Will you help to keep Islay’s beaches clean? A very nice tribute I think, very well done. The group has been visiting Islay for many years, I’ve shared a number of videos by them before. 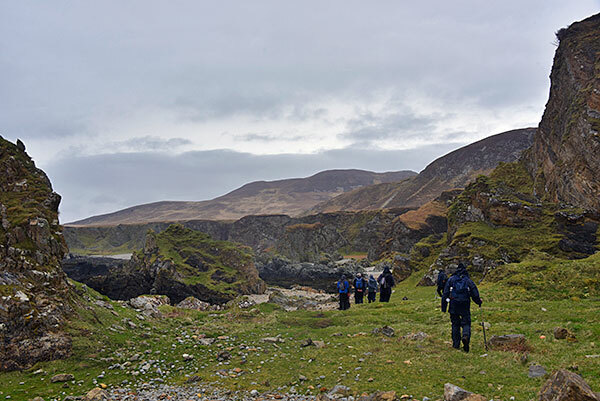 As it turns out they were on Islay at the same time as me in June, I actually took pictures of them leaving and returning to Kilchiaran Bay, where they had set up base. Unfortunately I hadn’t realised at the time that it was them, otherwise I would have gone over to have a chat. Maybe another time. Yes, over 5 minutes of not much happening (well, apart from the waves rolling into Machir Bay and breaking as they approach the beach). I hope you find it enjoyable and relaxing. 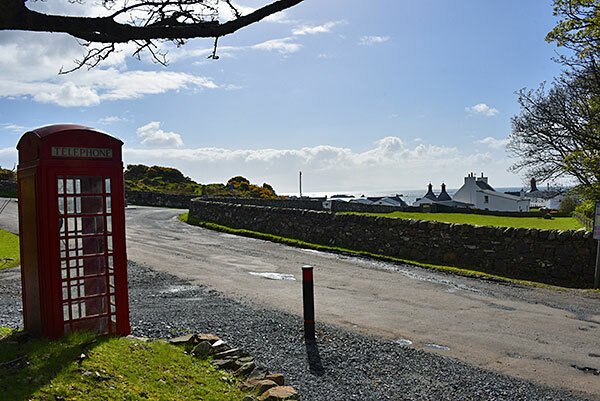 In a way a follow up to the Do nothing on Islay for 3 minutes post from a few years ago. I still think that’s quite impressive for 4.5 minutes, also a sign of how much Islay has to offer. It might be too fast and hectic for some, but then it might be exciting and fresh for others. I’m normally not a big fan of music for videos (certainly for my videos) and prefer more natural sounds, but here it felt appropriate so I used some. To avoid any rights issues (not to mention that the lyrics I feel often don’t really fit) I didn’t use any big hit(s) known to many but used some free music offered by Google. No lyrics, so no risk of conflict there either. The style of music will probably not be to everyone’s taste, I like the speed and energy in it. Now it’s over to you, I hope you enjoy and like the whirlwind tour of Islay. Let me know what you think.